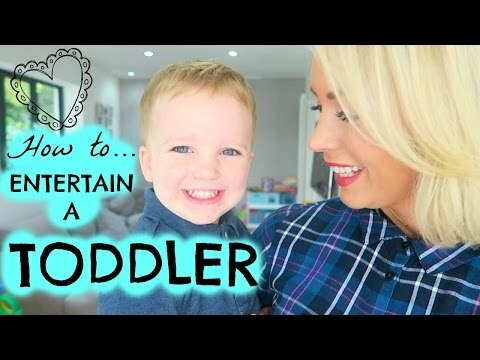 Here are some of the strategies that work well with toddler when they need to devote some attention to schooling. Rice/bean bins. All you need is a bin, some rice or beans, and some scoops or cups. (I use an under-the-bed storage tub because I actually store mine under a bed, and because that way it’s long enough for multiple children to use at once.) These require close supervision for really young children, so I set mine up right next to the table I’m working at so the young kids are always in sight. And may I mention that I strongly prefer beans to rice? You see, beans vacuum and sweep up easily while rice just gets blown every which way. Water bins/tables. These require a nice day and a deck…smile… but are great. Again, fill up a tub with water and provide scoops, bowls, and a few fun trinkets (some that float and some that sink) and let kids play ’til their heart’s content. Add a few drops of food coloring for extra fun! Accept before you begin that each child who plays will require a full wardrobe change. I actually use this one a lot while I’m making dinner- the kids are going into the bath at that point anyway, right? Please use your best judgement when allowing young children to engage in water play and ensure close supervision at all times. Paint with water books. Yes, they still exist and yes, they are still a great way to get some exploration going with less than half the mess of the full-fledged version. Puzzles. Use the manufactured variety or try making your own by cutting up pictures your child (or a sibling) has drawn. Special Play Boxes. The idea is that you only take these special boxes of toys out when you are homeschooling another child. These are special treats. Change them up every few weeks or so depending upon your younger child’s interests. Here, my youngest daughter is playing with matchbox cars as I work with her brother. Number Wheels. Print a color wheel and ask kids to place the corresponding clothes pin on the wheel. If your child isn’t ready for numbers yet, try putting colors onto the wheel and colored dots on the clothes pins for kids to match. If your child is really young, try just giving them clothes pins with a variety of things/materials to attach them to. Legos and blocks. These are great all by themselves, but can also be used in conjunction with props like dolls, cars, shoeboxes and paper towel rolls. What can kids make with them? Tweezers and pom poms. Provide some multi-colored craft pom poms and ask kids to sort by size or color. If the child is still very young, take away the tweezers and give them a yogurt container with a small hole cut in the top to stuff pom poms through. When they are done, open the container and start again. Pipe cleaners in containers. This is a variation of the pom pom suggestion: cut several small holes in a yogurt or coffee container and ask the child to stick pipe cleaners into them. For added challenge, color hole-reinforcers (like you use in three-hole-punched documents) and ask the child to match the pipe cleaner color to the hole reinforcer color. Magazine scavenger hunts. Really young kids can just rip up the pages, but slightly older toddlers can search through pages to find items you ask for, like pictures of smiles, flowers, a Mommy, etc. Alphabet or picture tracing sheets. This is as easy as laminating an alphabet practice sheet and providing dry erase markers. All done? Wipe and start again. Pool Noodle Stringing. Cut up pool noodles and provide yarn for little kids to string together. Magnetic Magazine Face-Making. Cut out eyes, ears, mouths, noses, etc. from magazines, laminate, and adhere to magnets. Then, provide your toddler with a magnetic surface to rearrange faces. Lacing boards. These can be made with leftover cereal boxes, or can be purchased. You punch several holes along the outline of a shape, and ask your toddler to weave shoestring in and out of the holes. Don’t expect perfection unless you are giving instructions- just let them do it on their own. Felt Face-Making. Same idea as above, but you use felt to create facial features and let little hands assemble the faces as they will. This idea can be adjusted to fit any theme you’re working on in your homeschool with just a little forethought. Cupcakes, ice cream cones, firetrucks, fish… the list goes on and on. Just create one large, major shape and provide lots of smaller shapes to adorn the large one. Soda bottle filled with glitter, oil, and water. Grab a two-liter and fill it with these ingredients for fun. Roll them, shake them and put them into containers. Remember to glue the cap on before you give this to your child! Clothesline Play. String up a pretend clothesline and provide a few socks, some felt clothes cut-outs, a few scarves, etc. plus a few clothespins and let younger kids have fun hanging up the wash.
Bathtub painting. Let a squirmy toddler paint in the bathtub with tempra or other washable paint. Just strip them down and let them go to town, then use the shower head to rinse it all (including what’s on their bodies) down the drain. Use your best judgement when it comes to supervising your child in the water (which you will need to use when you’re cleaning up the masterpiece). Giving babydolls a bath. This isn’t so gender-specific as you may think. You might be surprised at how many boys enjoy a small tub of water, plastic baby doll, towels and soap. This is another activity which may require a full wardrobe change, but is well-worth the effort. Color scavenger hunt. Give your child a paper bag with a color scribbled on the front, or a colored bag, and ask them to run around the house until they find items of that color to put in the bag. You should also *ahem* set some limits as to what can, and cannot, go in the bag. Bottles and cap matching. Take a bunch of used bottles (washed, of course) and let children match the caps to the bottles. Added bonus? This is a self-correcting activity, so when they get to the end and all the caps don’t match, they know they’ve made a mistake and can go back to find it. Rubberband/shoebox guitars. These are fun to play, and fun to make. Just a couple of shoeboxes with rubber bands around them create music (but not too loud) and lots of opportunity for exploration. Give them “work.” Give your younger child the same worksheet you give your older child and see what they do with it! The more authentic and identical the worksheet, the better. Pudding/Yogurt fingerpainting. This is another activity which necessitates prompt bathing (boy, I have a lot of those), but gives you peace of mind while you work with another student that your child won’t be ingesting paint. Tools like spoons and paintbrushes only add to the fun. Cutting practice. While themed printables are fun, you don’t need anything that fancy. Just draw some wiggly lines across a page and ask your older toddler to cut the marks you’ve made. PlayDoh prints. My kids will play with Play Doh for hours anyway, but they’re especially intrigued by anything that makes a print in the soft dough (think Legos, sporks, beaded necklaces, cookie cutters and little truck wheels). Sorting. Colored pasta, old keys, nuts and bolts. You name it, kids can sort it. Balloons. They don’t even need helium- just blow them up and provide a pool noodle for hitting, or tie bunches of them up with a bunch of ribbon and let your kids try to keep them in the air. Try giving kids a straw and having them blow their balloons around the room. Water transfer. This can be done with pipettes and small bowls of water, or with small pitchers. The key here is small amounts of water. Colored water is extra exciting. Masking tape obstacle course. You can tailor this to meet your child’s needs- put down a straight line and ask your child to walk/hop/skip along it. Create squares they must use to jump between, even adhere tape to the walls in a hallway and tell your child to try to go below the lines you’ve put up. Pattern Blocks. The idea is to use a set of blocks and ask your child to create the same patterns with the blocks that appear on a form. This can be done by tracing blocks you already have, or by purchasing a set. Give up. Really. When all else fails: skip school for the time being and give your babies the attention they need. I’ve seldom regretted calling it quits on a tough school day to give us all a chance to regroup, but I have often regretted not doing so. Realize that you aren’t a superhuman and there is nothing so important that should make you ignore a young child who wants and needs you.